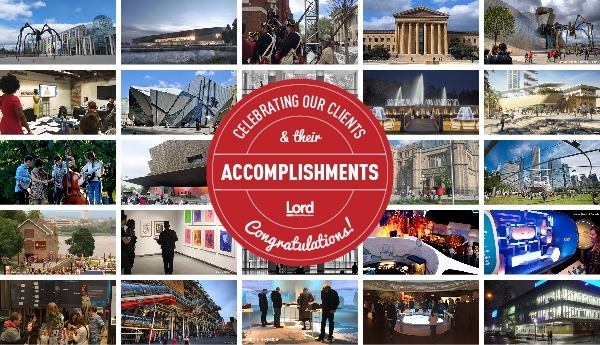 As the new year begins, we’re looking back on the many accomplishments of our clients over the past 12 months. From Munich to Miami, Bilbao to Bihar, there was much to celebrate in 2017, including anniversaries, openings, expos and more! Click through to see all our posts celebrating a plentiful year in global cultural accomplishments. Looking to the future, Artnet's "Complete Guide to the Biggest, Baddest, Boldest Museum Openings in 2018" features Lord projects the Grand Egyptian Museum in Giza, Maryland's Glenstone Museum, and Seattle's Nordic Museum. Here's to the exciting year of culture ahead! In 2017, Lord began developing an audience development and program plan for the Motown Museum. The Museum has had continued success following its October opening. A special exhibition of Sikh culture at the museum is drawing crowds, reportedly 2,000-2,500 tourists daily and up to 6,000 visitors on holidays. An exhibition on quantum technologies from the University of Waterloo’s Institute for Quantum Computing (IQC) is captivating curious minds at the newly reopened Canada Science and Technology Museum. "QUANTUM: The Exhibition", which opened to the public this weekend, is an interactive exploration of the science of the very small. The installation showcases how quantum technologies will revolutionize computers, information security, medicine and geographical exploration. "Imagine Greater Louisville 2020" was created to answer one question: How can arts and culture best serve the community? With help from a variety of funding bodies, the organization has put $500,000 towards 24 original arts and culture projects, prioritizing support of at-risk neighborhoods, youth engagement, and specific populations. The hotel and conference center expansion, which including more than 18,000 square feet of meeting space, will support the National WWII Museum financially and educationally, according to Stephen J. Watson, the museum’s president and chief executive officer. In 2017, Lord was re-engaged by the NWWIIM to assist Museum staff with defining its strategy for education and learning in the 21st century. Citylab describes architect Daniel Libeskind’s vision of the Monument as “a contemplation of the humanity and politics behind genocide”. Also quoted in the article are consulting historian Doris Bergen (University of Toronto) and project manager Susan Fisher (Canada’s National Capital Commission). The Louvre Abu Dhabi also topped the list of Architectural Record’s favorite designs in 2017 (December 27). Until mere years ago, Alserkal Avenue was an unknown area of Dubai even to its own residents. Property developer and patron Abdelmonem Bin Eisa Alserkal recognized the potential in the creative community that was beginning to gather in the neighbourhood: “I thought: ‘why not have more of a destination, or a community, of art galleries and creative businesses?” What had started organically soon became a carefully planned ecosystem whose growth has been remarkable. Alserkal Avenue also recently celebrated Canada’s sesquicentennial anniversary (Gulf News, December 7) with a series of events including live music, workshops, art, and talks. Gail Lord participated on the panel Milestones, Culture and the Changing Identities of a Country alonside Henry Kim (director and CEO of the Aga Khan Museum) and Manal Ataya (Executive Director and CEO of the Sharjah Museums Authority). Vatican City has been governed by men since it was established as an independent state in 1929. A year ago, however, a woman joined the upper ranks: Barbara Jatta, the first female director of the Vatican Museums. In the 12 months since her appointment by Pope Francis from an initial list of six candidates, Ms. Jatta has put her stamp on the role, resisting some of her predecessor’s initiatives and forging her own path. The Art Newspaper looks at 10 of the most important purchases and donations that entered public collections in 2017. The diverse list includes American photography (Art Gallery of Ontario), Native American sculpture (Metropolitan Museum of Art), 17th-century Dutch and Flemish paintings (Boston's Museum of Fine Arts), and even a “Pussyhat” (Victoria and Albert Museum). British Columbia’s Audain Art Museum, with whom Lord worked in 2012, is included on the list. Yale art historian Vincent Scully inspired students for more than 60 years and published writings on architecture which would have a decisive influence on its practice in the last half of the 20th century. A new urbanism ally and an advocate for historic preservation, he received the National Medal of Arts in 2004. Artsy’s editors argue that visual culture is a “an ever-expanding field, comprising not just art, photography, and design, but also memes, advertising, histories of representation, and the very technologies through which all this flows.” Their list of the 25 individuals who had the biggest impact in changing the visual landscape this year is accordingly diverse, including accomplished artists, passionate activists, and visionary entrepreneurs. The National Gallery of Canada announced that the artist collective Isuma, led by Kunuk and Norman Cohn, will represent Canada at the biennale. Their filmmaking merges “early activist video with ancient values of collective survival,” with stories which rooted in the Canadian north, have worldwide resonance. Their participation in Venice marks the first presentation of art by Inuit in the Canada Pavilion. The art critics of The New York Times (Roberta Smith, Holland Cotter and Jason Farago) share their picks for the best art of the year: a list includes New York gallery highlights, fashion, popular film and even protest. For a city striving to become a major technology center, it was a prize catch: A Google corporate sibling would spend the coming year planning a futuristic metropolis in a derelict part of Toronto’s waterfront. The project is one whose success relies on "a marriage of data and urbanism"; sensors and data collection will be key components of developing, optimising, and maintaining the neighborhood. But tempering the excitement of some Toronto residents are concerns about surveillance and equity. Where are America’s leading art centers and scenes—the places where working artists actually work and produce art? Richard Florida digs into the data to explore connections between geography and creativity and how they’ve changed between 2011 and 2016.